Nanny Poppinz is A 27/28 Company. 27 Years Old and 28 Thousand Happy Families!! Nanny Poppinz provides a variety of Nanny childcare services to Richmond including: date-night Nannies; newborn/infant care specialists; after school Nannies; a Nanny for school off days; and full-time or a part-time live in or live out Nanny. We even have an emergency on-call Nanny to look after children that are sick and unable to attend school. At Nanny Poppinz, we customize our services to meet your family's needs including overnight and/or emergency back up Nanny care. You can use our Richmond Nanny services at a moments notice. Nanny Poppinz is open 24 hours a day and 7 days a week, including holidays, and specialize in dispatching your Richmond Nanny in just a few moments after receiving your call for assistance with your emergency child care needs. Another way we customize our service is by sending Nanny candidates who can work anywhere from one evening up to a full-time live-in and everything in between. Whatever a family needs, whether it is short-term Nanny or long-term such as a permanent part time or full time Nanny, we find Nanny candidates for our families to interview. 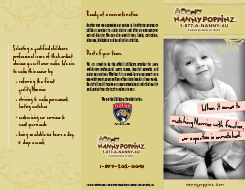 Every family has unique child care needs or problems, and at Nanny Poppinz of Richmond we aim to be the SOLUTION. Nanny Poppinz childcare is available 24 hours per day, 7 days per week for our Richmond families because we as moms know that childcare emergencies do not happen from 9am to 5pm Monday through Friday. When you call Nanny Poppinz you will speak to a representative of Nanny Poppinz who can listen to your needs and work with you to solve your Nanny childcare situation no matter the time of day or night. Our Richmond clients tell us that this Nanny service and availability ANYTIME gives them such "peace of mind". Our Richmond Nanny childcare service in can be utilized by your family in many different ways, not just childcare. Some of them will do the families laundry and ironing, some housework, or even run errands to the grocery store and drop off dry cleaning. We customize our Nanny services to meet your family's Nanny needs. Today's Richmond lifestyles are so fast paced with increasing amounts of information coming at us at accelerated speeds, that it can be difficult to focus on whats most important. It is Nanny Poppinz mission to see that your Richmond family has added peace of mind through the high quality childcare of our exceptional Nannies. Nanny CPR/AED training will be provided by Breath Of Fresh Air in Mechanicsville, Virginia. Nannies can schedule their CPR course by calling 804-539-3809 or emailing services@cpr-bofa.com or visiting their website Breath of Fresh Air to make a reservation. You must identify yourself as a Nanny Poppinz Nanny (You will receive a discount) when you make the reservation. After the completion of the course and when you are referred to a full or part time Nanny Poppinz Nanny position, you will need to send the course receipt to Nanny Poppinz and you will be reimbursed for your CPR training cost. For information on how to become a Richmond Nanny Poppinz Nanny and to schedule a Nanny interview please call Susan at 703-600-9103.